Q: When will we know that the Baby Boomers are getting old? I think we’re there. I’ve done my last will and advance directive documents. I’m an organ donor. But I haven’t gotten around to making arrangements for disposal of my remains when the inevitable happens. One reason for my hesitance may be that I read and never forgot Jessica Mitford’s brilliant expose of the American funeral industry, The American Way of Death (1963), and her updated revision, The American Way of Death Revisited (1998). In both volumes Mitford addresses the ways in which the funeral industry exploits the grief and shock of the bereaved to charge jacked-up prices for often unnecessary services. The 1998 update asserts that things have gotten even worse with the conglomerates swallowing up the local mom and pop operations which once dominated the industry. It’s like this: The corrupt and sadistic medical insurance industry plays games with our mental and physical health and then, at the end, the funeral industry delivers the final punch in the face. This comes to mind because I’ve had to think about death and dying more than usual this year. And, as I commented to my mother recently, I’ve spent more hours in cemeteries this year than I ever imagined spending in my entire life. My mother visits my father’s grave every day and when I’m in town I go over there with her. My parents have four plots in Elmwood Cemetery in Birmingham. Dad is there and Mother will be beside him but the two extra plots haven’t been claimed. Mother’s hints that she wants me to take one of the remaining plots have become gradually more frequent and more insistent. 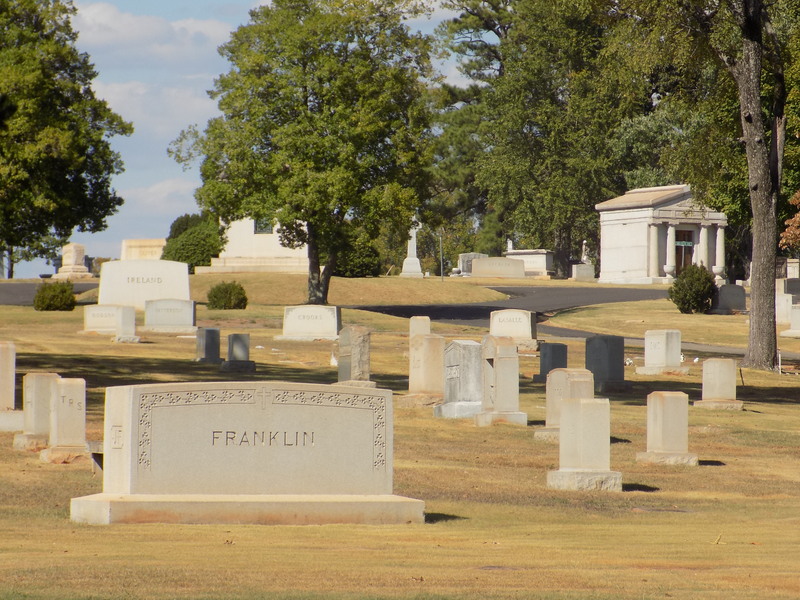 Elmwood is a beautiful cemetery, one of Birmingham’s oldest and one of the largest in the country. It’s a beautiful and peaceful place and its inhabitants are a composite of the social, cultural, political, artistic, medical, academic, industrial, and sports history of the city. The Elmwood staff was lovely to my family as we made arrangements for Dad’s memorial and burial there earlier this year. If I decide to be buried, I would be perfectly happy to be buried at Elmwood if they allowed natural burials. There is still a lot of confusion and misunderstanding about what kind of burial is “natural.” It’s ironic, really, since most Americans had some form of natural burial before modern times and modern laws and the emergence of a very powerful funeral lobby. There is a history of embalming throughout civilization, of course, but modern funeral practices and preservation really took hold in the United States during the Civil War when embalming became a way of preserving soldiers’ bodies so they might be returned to their families. “Morticians” around that time re-classified themselves as “Funeral Directors” and the modern death mega-industry was born. Here’s what I mean when I say I want a natural burial: I want my physical remains and the vessel that contains them to go back to the earth as naturally as possible. My preference is to be buried in a pine coffin without any sort of preservative and let nature take its course and reclaim my remains. That means no embalming or preservation of any kind, a coffin that is biodegradable, and no burial vault. As I’ve researched natural burial, I have found that the tree-huggers can be just as rigid in their own way as the funeral conglomerates. For example, many natural burial sites do not allow tombstones or markers, or they mandate burial in shrouds. I’d personally like an upright stone marker at my grave and I wouldn’t mind being buried wearing clothes. I would always prefer gentle and natural burial to harsh cremation (who among us really wants to be burned to a crisp in a fire?) but the restrictions imposed by the industry do not necessarily support my preferences. The only reason I might consider cremation is if I am unable to be guaranteed the kind of natural burial I desire. The options of cemeteries that allow natural burials are still few and far between and I have found only one in Alabama and it’s too far from home. Having my ashes cremated and scattered is the closest thing I can conjure to natural decaying as a way of returning to the land if I can’t be buried according to my wishes. I know that thinking too much about such things may seem (and is) morbid, but after a year of the deaths of several loved ones and friends, it’s better to be safe than sorry. This entry was posted in natural burial and tagged American funeral industry, American Way of Death, Baby Boomers, Elmwood Cemetery Birmingham, Jessica Mitford, natural burial on October 3, 2016 by gedwardjourney.